A new ski resort opened in Kanggye, the capital of Chagang Province, on January 7, 2108, as reported by the Rodong Sinmun on January 8th. It is said the ski resort will serve as a “base for providing public sports services” for North Korean people. “The ski resort, built on Mt. Jabuk on the outskirts of Kanggye, is fully provided with facilities for the workers and youth to enjoy sporting activities and rest, including sledge runs, beginner and intermediate slopes, ropeway, surface lift, and medical treatment room,” the North Korean state newspaper said. 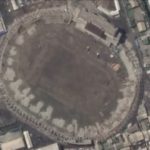 “Constructing the resort in line with the country’s reputation as a civilized socialist power, North Korea has created another base for public sports services that will contribute to endow the workers and young students with solid physical strength,” it added. At the opening ceremony held on January 7th, Kim Jae-ryong, Chairman of the Chagang Provincial Committee of the Workers’ Party of Korea (WPK), called the Kanggye Ski Resort a “monumental creation in the days of the WPK.” In the interest of Chairman Kim Jung Un, he said, the government officials and workers in the province have completed the construction in a short period of time through their own technologies and resources. He also stated that under the “strenuous efforts first” principle, the workers in the province’s machinery industry have built and installed many facilities and equipment such as a surface lift and ropeway. According to a Rodong Sinmun report in July, the Kanggye Ski Resort, which is built in the Sokjo district of the city, is equipped with ski slopes, sledge runs, restaurants, lodging facilities, cultural and welfare facilities and parking lots. The entrance of the ski slopes are said to be marked with gate posts featuring distinctive designs. There is also a pavilion from which one can view the surrounding landscape. It is reported that water from a reservoir can be accessed to produce artificial snow in the event of a shortfall of snow. The resort also operates snow groomers. Skiers can take the surface lift get to the beginner slopes or sledge runs. There is ropeway access to the pavilion at the top of the ski slopes, where skiers can get a bird’s eye view of the city of Kanggye. The Kanggye Ski Resort is North Korea’s second ski resort—the first being the winter resort at Masikryong Pass, which opened in early January 2016. Various North Korean media agencies are actively promoting the new resort, perhaps reflecting North Korean leader Kim Jong-un’s interest in winter sports. North Korea on Monday denounced a set of United Nations Security Council (UNSC) sanctions against Pyongyang’s nuclear and missile tests as they are hampering the country’s development in the sports field. Kang Ryong-gil, deputy secretary general of North Korea’s Olympic Committee, told foreign reporters in Pyongyang that the sanctions “hinder the aspiration of North Koreans to develop sports,” according to the Korean Central News Agency (KCNA). He claimed that the UNSC sanctions resolution adopted in March last year even included recreational sports equipment on a list of banned luxury goods. Kang’s remark came as the UNSC imposed tough sanctions against North Korea in March and November 2016 for its two nuclear tests and a long-range rocket launch. The resolutions focused on curbing the inflow of hard currency to the regime. It also came as North Korea plans to take part in the Asian Winter Games in Sapporo, Japan, which will be held from Feb. 19 to 26. The sanctions led some countries to impose exports bans on North Korea over such sports equipment as skis, yachts and mountaineering boots, he said. The blockade of money transfers also prevents fund assistance which the International Olympic Committee (IOC) provides for sports development in member countries. “The thing is that sports firearms can never be turned into rockets nor rockets be fired from them,” Kang said. 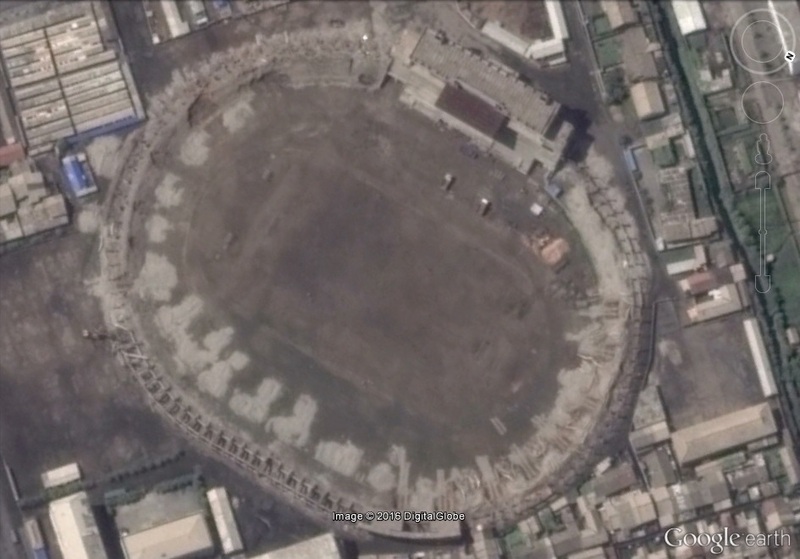 Pictured above (Google Earth): (L) Sinuiju Stadium on 2015-3-12, (R) Sinuiju Stadium on 2015-9-2. 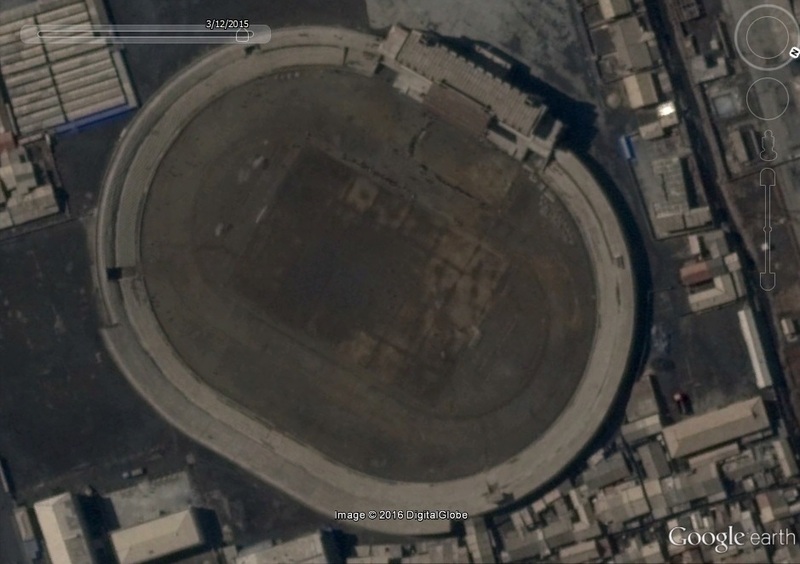 The stadium is either being renovated or this will be the location of the North Phongan Sports Village. New imagery will reveal the answer! More at RFA here (in Korean). Sometimes private citizens can ease tensions between governments when public officials cannot. Since we met NBA Hall of Famer Dennis Rodman in May, we have been helping to coordinate his visits to the Democratic People’s Republic of Korea and organize an international basketball tournament sponsored by Irish bookmaker Paddy Power. Seeing as our government has branded the DPRK a “critical” national security threat, we find it reflects badly on Foggy Bottom that the three Americans best acquainted with its supreme leader are a retired NBA star, a mixed martial arts fighter and a tuba-playing human geneticist. Mr. Rodman constantly reminds those around him to “just do one thing: Do your job.” Now it seems he is picking up some of the slack for the U.S. State Department. In 1967, presidential candidate Richard Nixon expressed his hope for détente with Peking, writing, “There is no place on this small planet for a billion of its potentially most able people to live in angry isolation.” On Christmas 1970, People’s Daily ran a front-page story with a photograph of Chairman Mao Tsetung and American journalist Edgar Snow standing side by side atop the Tien An Men rostrum; at the top of the page, the day’s Mao quote: “All the peoples of the world, including the American people, are our friends.” While Washington dismissed this gesture given Snow’s sympathy for Mao, in retrospect it seems it was intended as a subtle olive branch. With spring came a chance meeting between American and Chinese ping-pong players concluding with an exchange of gifts. This simple act of humanity touched off a string of cultural and, later, diplomatic interactions. Henry Kissinger’s secret visit to Peking that summer paved the way for “the Week that Changed the World.” Although Nixon and Mao certainly did not see eye to eye, their shared view that diplomacy is preferable to both isolation and war made normal relations between Washington and Peking possible. The value of cultural exchanges consists in their power to erode misconceptions. For instance, Dr. Terwilliger spent a month this summer in Pyongyang teaching human evolutionary genetics to a class of very talented Korean undergraduates. Aside from teaching scientific critical thinking, he took care to present his students with the best side of the American people, to demonstrate that we are a generous and friendly people rather than the “brigandish aggressors” of the familiar caricature. He was both surprised and encouraged by their interest in Mr. Rodman’s February visit. They noted that hearing Mr. Rodman say nice things about their country made them rethink their stereotypes about Americans, for they had now seen one embracing their leader. Many had even read Mr. Rodman’s autobiography and remarked that they admired his frankness in describing the difficulties he faced in his early life. Such reactions can only bode well. Hostility is inevitable when the common man on each side sees highlighted only the worst aspects of the other. Mutual understanding is where rapprochement starts. While the first few timid steps may proceed slowly as trust is built, the example of Ping-Pong Diplomacy demonstrates that if the momentum is sustained it can offer governments new options with which to pursue peace and may even be developed into a full gallop (what the Koreans call “Chollima speed”) toward rapprochement. At the very least, track-two diplomacy can present unique opportunities for engagement between private citizens whose governments remain at odds. Mr. Rodman would be the first to recognize that he is neither a politician nor a diplomat — and yet, that is precisely what makes him such a promising agent of reconciliation. As a cultural icon, Mr. Rodman has the power to project a relatable human face in a way a government functionary simply cannot: by doing down-to-earth things all people can enjoy. An associate professor at Columbia University in New York City, Joseph D. Terwilliger was a member of Dennis Rodman’s September and December delegations to Pyongyang. John Doldo IV, a Watertown native who has also spent time in North Korea, has been working behind the scenes helping to coordinate many aspects of the project. Both authors worked on a strictly voluntary basis in order to avoid any financial conflict of interest. Irish betting company Paddy Power has ended its partnership with Dennis Rodman and his “basketball diplomacy” initiative. “We have been reviewing the partnership on an ongoing basis, and with the benefit of hindsight, we probably got this one wrong,” company spokesman Paddy Power (and son of Paddy Power’s founder, Paddy Power) tells NK News. “Circumstances have changed quite a lot in North Korea; there has been worldwide scrutiny of the North Korean regime, probably more in the past month than in the past couple of years. Though they won’t be involved, Rodman’s plan to bring 11 other former NBA players to Pyongyang is still a go, according to Power. “Dennis is very appreciative of Paddy Power’s support up to this point for this historic game of basketball diplomacy taking place on Jan. 8th,” Rodman’s agent Darren Prince told the Associated Press. Here is an article on the history of Rodman and Paddy Power. ORIGINAL POST (2013-12-21): Dennis Rodman has made his third trip to the DPRK. Trip one post here. Trip two post here. 3. Dennis Rodman “leads” training for DPRK team. Game scheduled against an American team in January. Pic 1, Pic 2, Pic 3, Pic 4, Pic 5. 2012-12-20. Here is AP video of the training. Rodman is smoking a cigar. Rodman and the group left the DPRK without meeting Kim Jong-un, however, I suspect that he will get together in the upcoming fourth trip slated to take place in January. “It has nothing to do with me. I mean, whatever his uncle has done, and whoever’s done anything in North Korea, I have no control over that,” Rodman said in Beijing. “I mean, these things have been going on for years and years and years. “I’m just going over there to do a basketball game and have some fun,” he said. Ahead of the trip, Seoul-based North Korean human rights activist Shin Dong-hyuk said in an open letter in the Washington Post that Rodman should talk to Kim about human rights abuses in North Korea. Rodman said it was not his place to talk about such issues. “People have been saying these things here and there. It doesn’t really matter to me. I’m not a politician. I’m not an ambassador,” he said. “I’m just going over there to try and do something really cool for a lot of people, play some games and try to get the Korean kids to play,” he said. “Everything else I have nothing to do with. If it happens that he wants to talk about it then great. If it doesn’t happen I just can’t bring it up because I don’t (want) him to think that I’m over here trying to be an ambassador and trying to use him as being his friend and all of a sudden I’m talking about politics. That’s not going to be that way,” Rodman said. Rodman is expected to provide North Korea’s national basketball team with four days of training during the trip. Here is a video interview with Rodman at the Koryo Hotel. Here is much of what he said in the video printed in an article. He also intends to return to Pyongyang in January with a team of fellow former National Basketball Association stars to hold basketball games on Kim’s birthday. 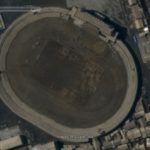 International soccer’s governing body FIFA has provided funds worth $500,000 to build infrastructure to update a soccer academy in Pyongyang, a media outlet reported Thursday. The International School of Football opened earlier this year and has been training North Korean youths between the ages of 6 and 13, according to a report by Radio Free Asia. The Washington-based broadcaster said support was given as part of its “goal project” to help build football-related infrastructure in less affluent countries. FIFA started providing support to the North from 2001 onwards, with around $2 million having been spent so far on six development projects. Related to the school, North Korean media said its leader Kim Jong-un in June personally designated a name for the new facility that opened on May 31. FIFA gives funds to improve soccer academy in N.K. The first chairman of the National Defence Commission of North Korea, Kim Jong Un, took office two years ago. Since then, construction of sports and entertainment facilities are reported to have increased considerably. According to the South Korean Ministry of Unification, North Korea’s Pyongyang Folk Park (September 2012), Taesongsan General Hospital (March 2013), and Haedanghwa Service Complex (April 2013) were recently completed. Since the launch of the Kim Jong Un regime, the Masik Pass Ski Resort and other similar sports facilities have been undertaken and are nearing completion. In addition, the People’s Theatre (April 2012), Rungna People’s Pleasure Ground (opened in July 2012), Sunrise Restaurant (September 2012), and Unification Street Center (September 2012) have been recently renovated. In addition, the Mirim Riding Club, Pyongyang Gymnasium, Munsu Wading Pool, Aprok (Yalu) River Amusement park, Karma Hotel, and New Day Hotel and other hotels around Pyongyang are currently under renovation and repair. 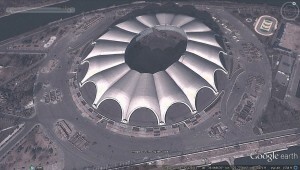 Entertainment and sports facilities around other major cities are being constructed as well. Furthermore, after the successful launch of Kwangmyongsong 3-2 last December, North Korea has begun to construct major residential complexes for scientists, granting them preferential housing in Unha scientist residence, Kim Il Sung University educator residence, and Pyongsong residence. Other large-scale housing projects are also reported to be under development. In the wake of major celebrations in North Korea — such as the 100th anniversary of the birth of Kim Il Sung and 60-year anniversary of the “Victory in the Fatherland Liberation War” — a large memorial was erected and existing facilities were repaired. Specifically, the Korean People’s Army Exhibition of Arms and Equipment, Kumsusan Memorial Palace, War Victory Monument, and the Cemetery of the Fallen Fighters of the KPA were refurbished. Unlike the large-scale construction of sports and entertainment facilities, new constructions of harbors, roads, power plants and other social overhead capital (SOC) is reported to be in decline. Last August, North Korea’s trade with China has shown an 8 percent increase in exports and 6 percent decrease in imports, following a similar trend from last year. According to the South Korean Ministry of Unification, North Korea’s current trade volume with China is reported to be 4 billion USD (1.89 billion USD in exports and 2.2 billion USD in imports). North Korea’s most popular export items are mineral resources such anthracite, coal, and iron ore. In the case of clothing products — which are mostly consigned processing — there has been an increase of 42 percent (200 million USD) against the previous year. Major categories of imports from China are crude oil, food, and fertilizers. Compared to the previous year, food imports have declined 57 percent (17.4 million tons), and fertilizer and crude oil imports are also showing gradual reduction at 27 percent (18.3 million tons) and 6 percent (34.6 million tons), respectively. North Korea has approved for the first time the hoisting of South Korea’s national flag and playing of its anthem on the communist country’s soil, the unification ministry said Friday. The move comes as the North invited South Korean weightlifters to attend the 2013 Asian Cup and Interclub Weightlifting Championship to be held in the communist country, the Ministry of Unification said. If realized, it will be the first time in history that South Korea’s national flag, the Taegeukgi will be raised and the national anthem performed in North Korea. The ministry in charge of all inter-Korean relations said it approved the cross-border trip by the 41-member team made up of South Korean weightlifters and officials who plans to visit Pyongyang next week for a nine-day stay to attend the international sporting competition. The event is set from Sept. 11-17 in the North Korean capital. Officials here said approval was given because the event is an international gathering organized by the Asia Weightlifting Federation, and Pyongyang vowed to guarantee the safety of the athletes from the South. Such reconciliatory gestures from both sides are in line with a recent series of signs of thawing relations following a deal to restart the shuttered joint industrial park in the North’s border city of Kaesong and to arrange reunions for families separated by the 1950-53 Korean War. 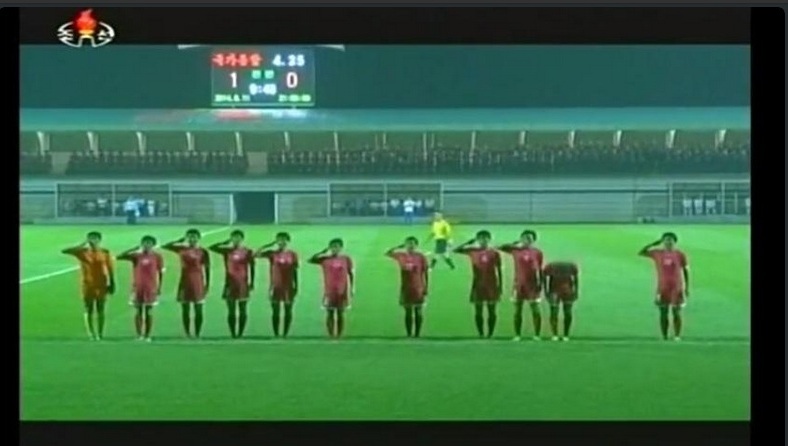 In 2008 I attended a DPRK-ROK World Cup prelim match in Shanghai. 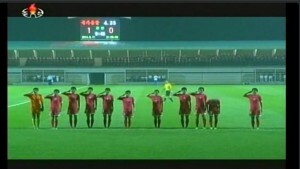 The game was supposed to be held in Pyongyang, but the North Koreans refused to allow the South Korean anthem and flag to be used (as the South Koreans had done).